Declared Patrimony of the Humanity in 1982 is one of the largest game reserves in the world, it’s area is the same as the Republic of Ireland, being the largest game reserve in Africa. It’s name is because of the British browser Frederick Courtenay Selous, who died in these land during the First World War, its tomb is near the bank of the Baho Baho river. The access to the park is a little beat uncomfortable because the journey lapses for a hint without asphalting that cross small charm villages. A third part of its landscape is covered with Miombo forest but we can also find plains, savannah… The Rufiji river flows through the reserve allowing to the visitors to do a boat safari, an unforgettable experience. Accompanied by a ranger you can enjoy a walk until an area denominated “maji moto” (hot water). the legend tell that if you take a bath or you wet yourself in these waters you will have good luck and you will drive away the bad spirits. between March and May (the long one). Latitude 7: 15` & 10` 15`s and Longitude 36 00` 38 45`e. Of 110 to 1250 m. above sea level. Large concentration of wild life, Rufiji river and miombo woodland. 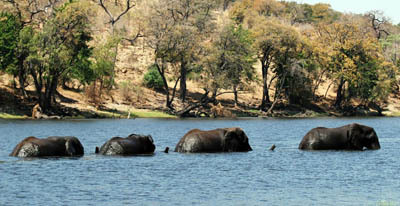 The largest elephants population, lion, leopard, spotted hyena, hippopotamus, buffalo, giraffe, wildebeest antelope, warthog, zebra, hartebeest, Greater Kudu, sable antelope, eland, reedbuck, bushbuck, waterbuck, over 350 species of bird and reptiles such as crocodiles and various snakes and lizards… and two species very difficult to find in other parks: rhino and wild dog. 250km from Dar Es Salaam to Impala Camp (6 hours more/less). 290 km from Dar Es Salaam to Mbuyu Safari Camp (7 hours more/less). 300 km from Dar Es Salaam to Beho Beho Safari Camp (8 hours more/less). Luxury lodges, two camp sites and aerodrome. Impala Camp, Mbuyu Safari Camp, Beho Beho Safari Camp, Rufiji River Camp.